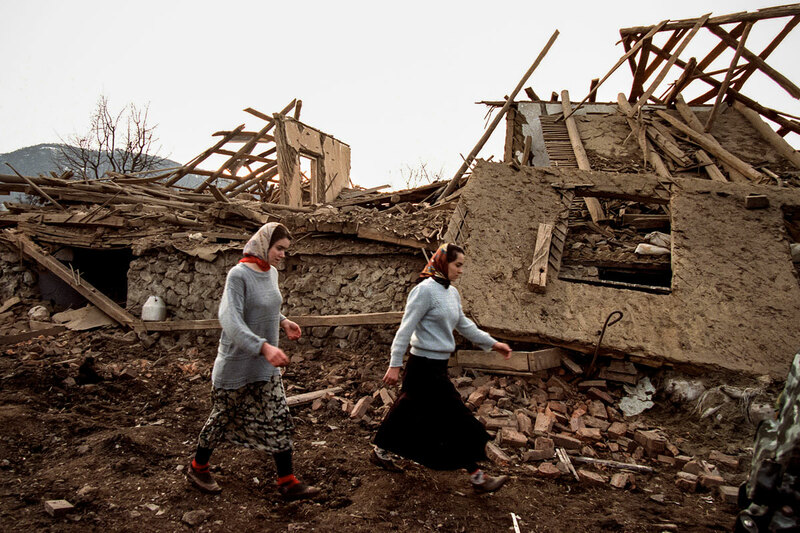 Through a devastated landscape, at the side of Commandant Khattab and Shivarni Basayev. 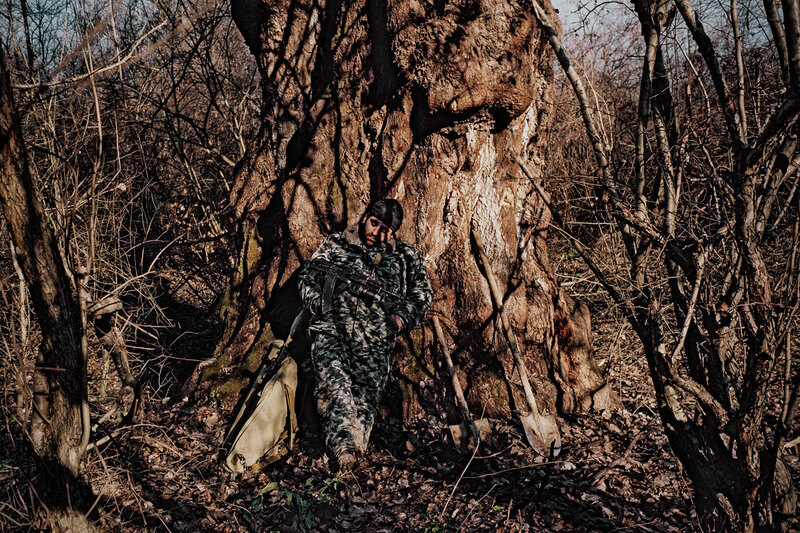 The warrior leader Shamil Baseyev and his family come from here while the Commandant Amir Khattab who had lost his his own hand fighting in Afghanistan is a Saudi who identifies himself only as "a soldier of international Islam." 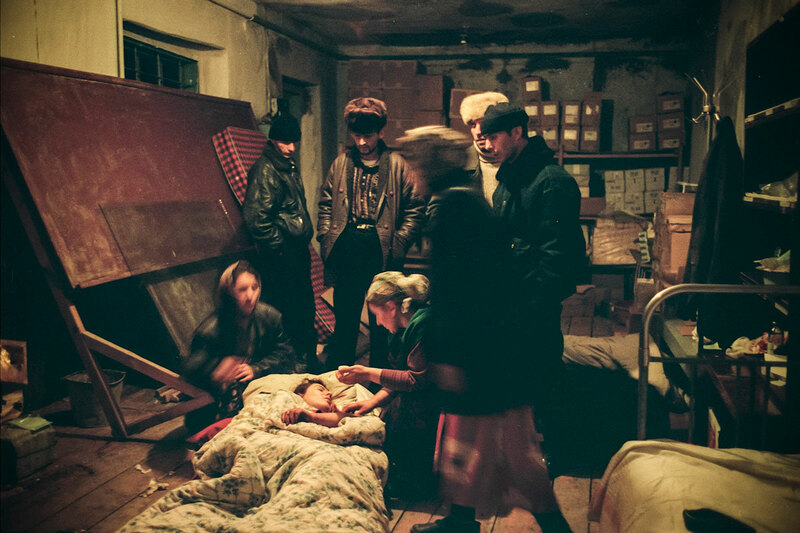 This village launched the famous raids on Dagestan, to serve as a pretext for Putin to trigger the second Chechen war. 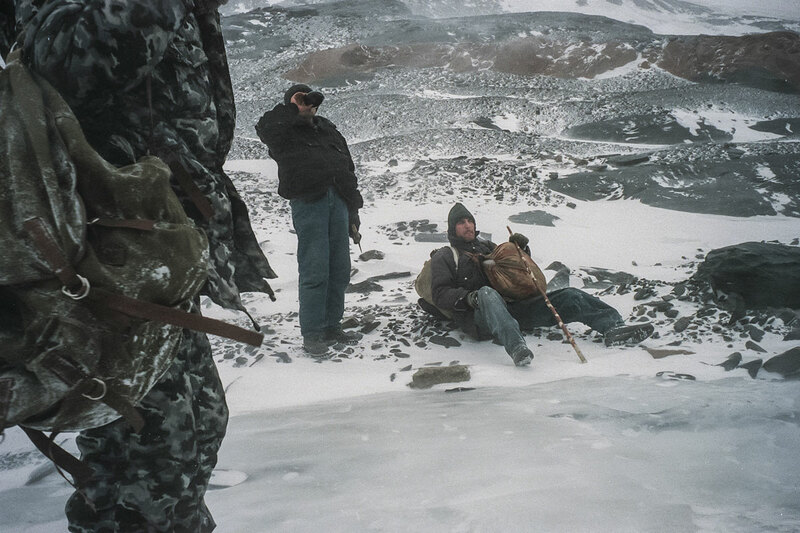 Commandant Hassan (chief of Basayev's security personnel) with Commandant Sayed, south of Shali, which has been encircled by the Russians. 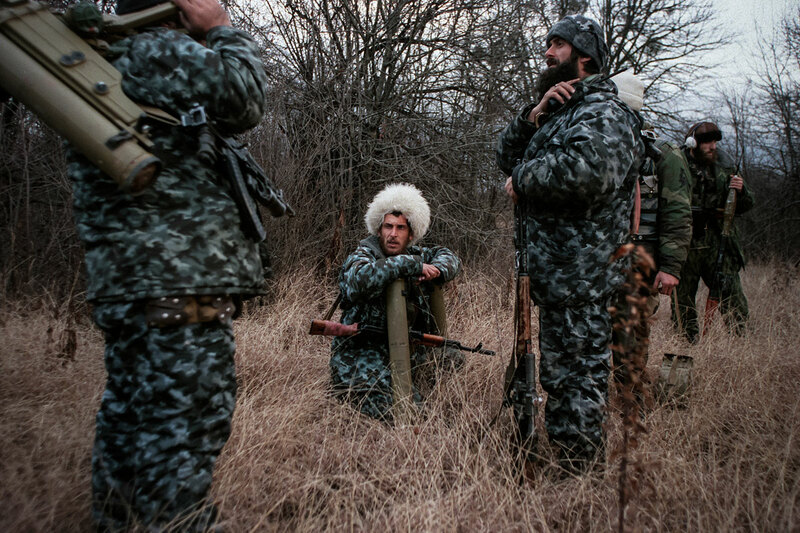 Infiltrating the Russian lines, the Chechens mean to destroy a Russian tank. 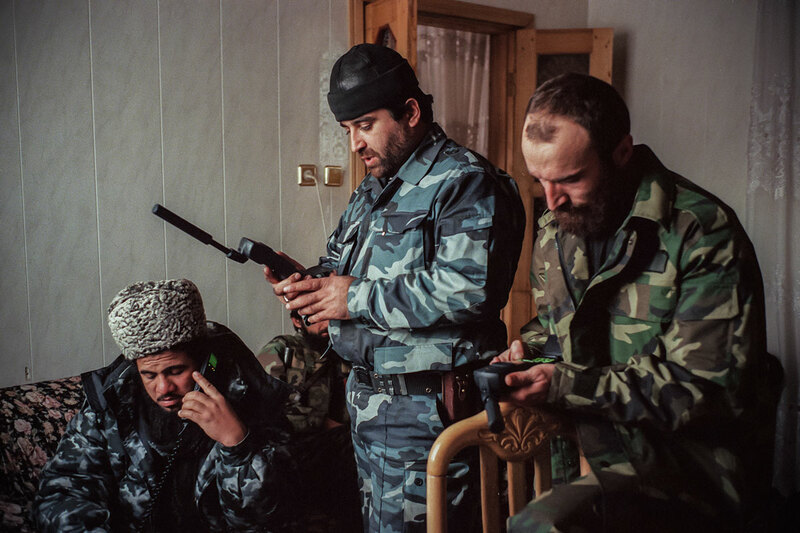 Amir Khattab (on a mobile telephone), wearing the typical astrakhan hat of the region; Commandant Sayed and Shirvani Baseyev, brother of Shamil, checking their mobile phones. Commandant Sayed, south of Shali, which has been encircled by the Russians. 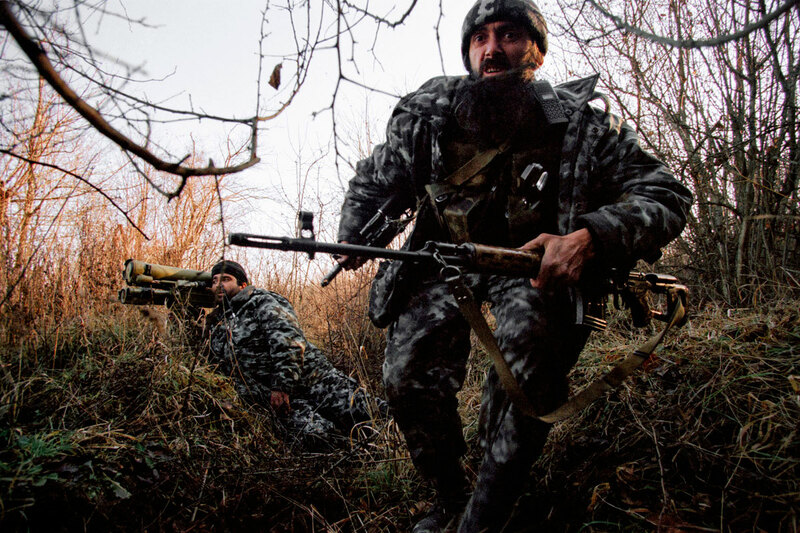 Infiltrating the Russian lines, the Chechens mean to destroy a Russian tank. 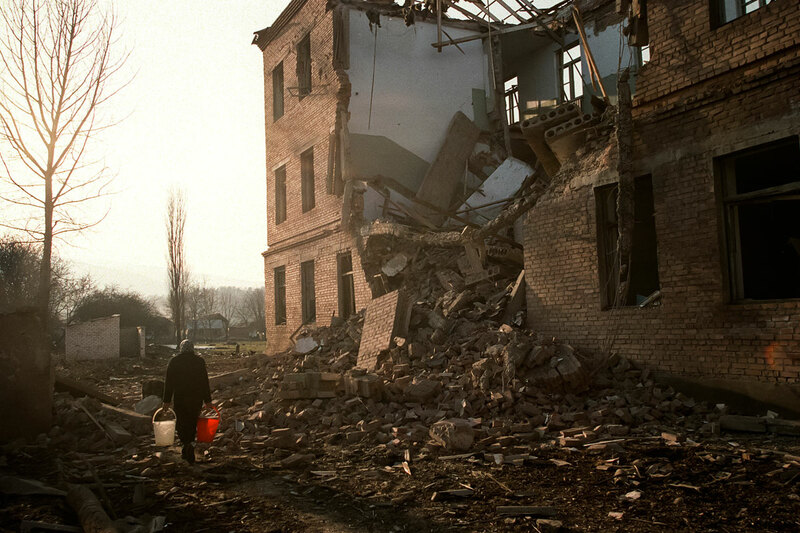 A school dating from the Soviet era and destroyed by an Russian air raid. 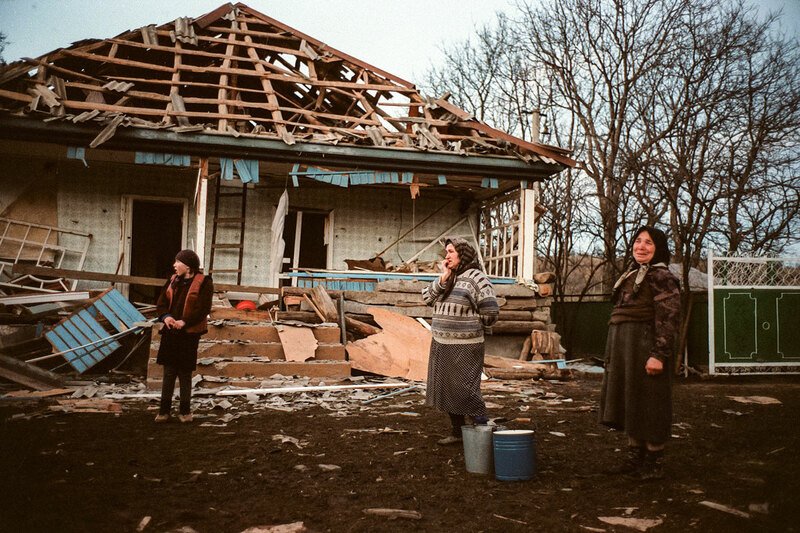 Farmhouses ruined in a Russian aerial attack. Funeral of the brother of Commandant Sayed, killed in action in the Shali region a few days earlier. 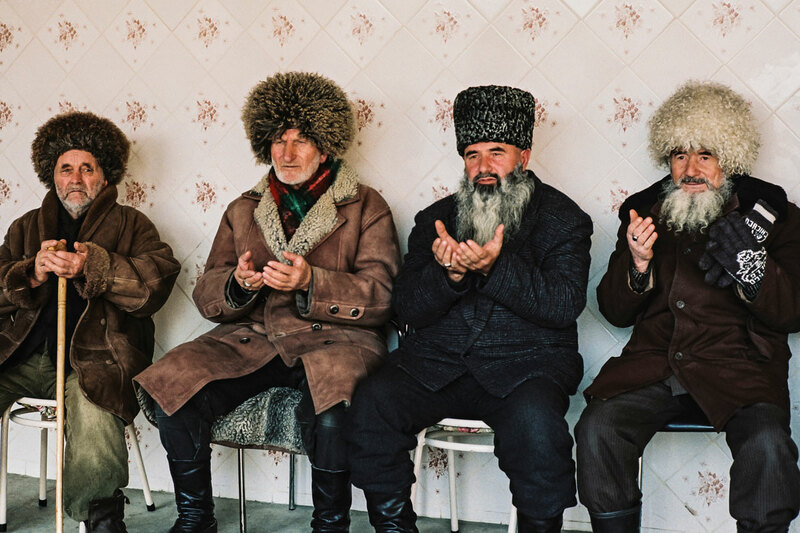 The elders of the village, including the father of Shamil Basayev (far right), receive the people's condolences. 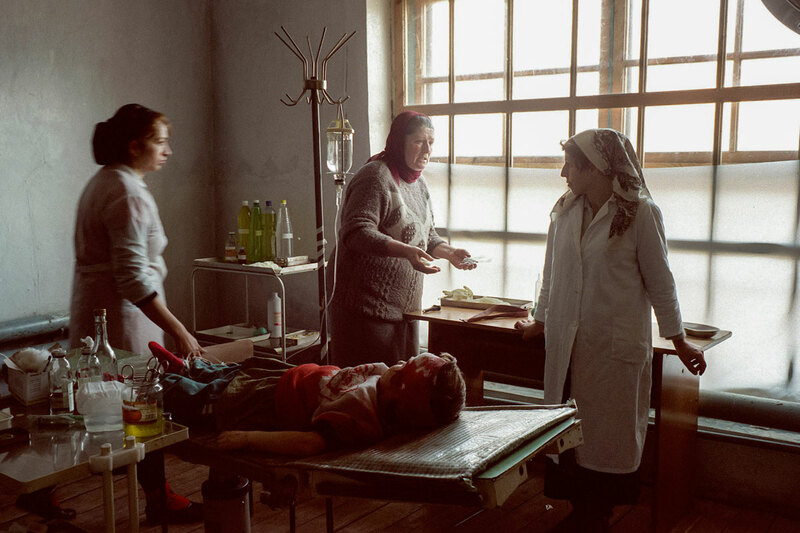 A school converted into a hospital, the victims of an air attack on a bus that had left 15 dead, 40 injured. 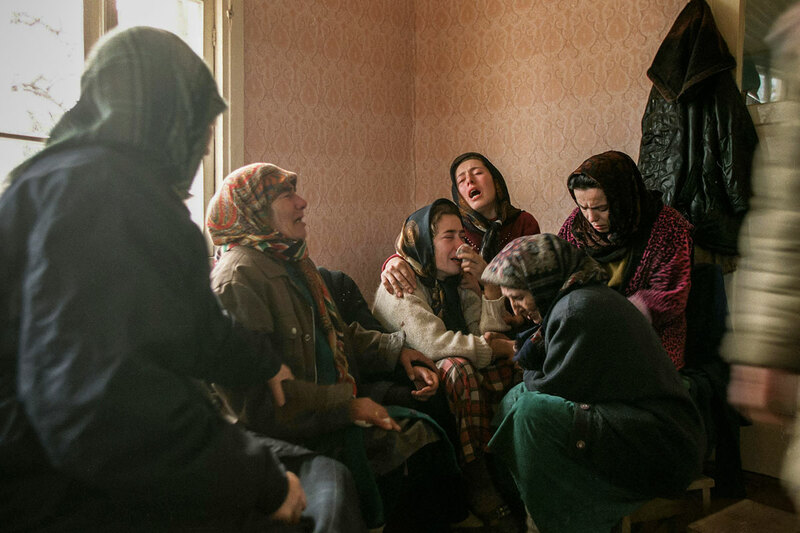 The wake for a 55-year-old woman killed in a bombardment. 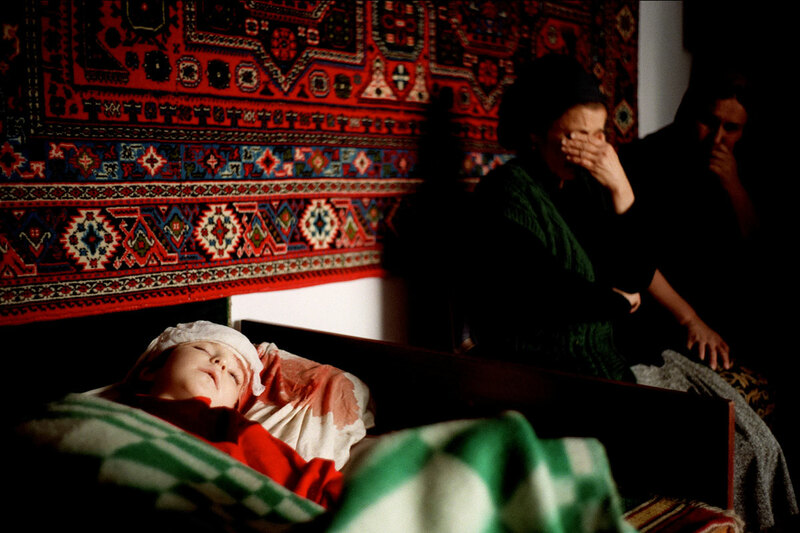 A five-year-old boy named Aminat, wounded in the head during an aerial bombardment on his family's farm, rests at his home. 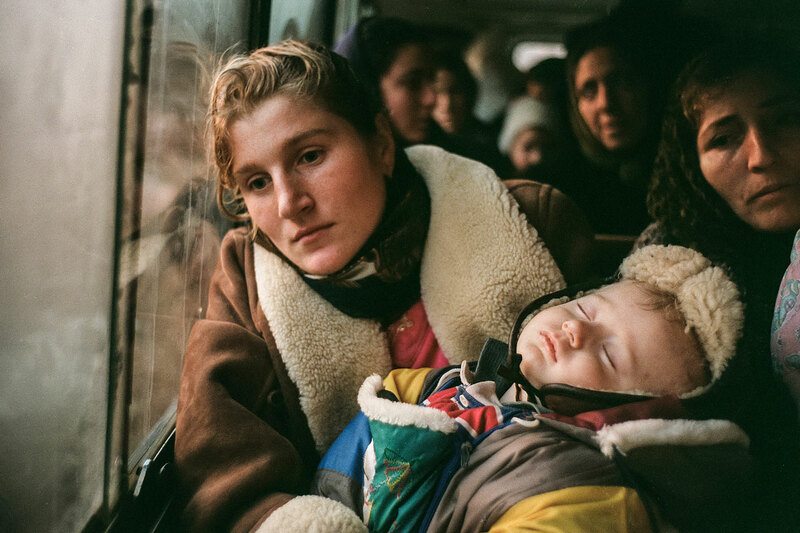 A Chechen woman and her child in a bus headed for Dagestan. 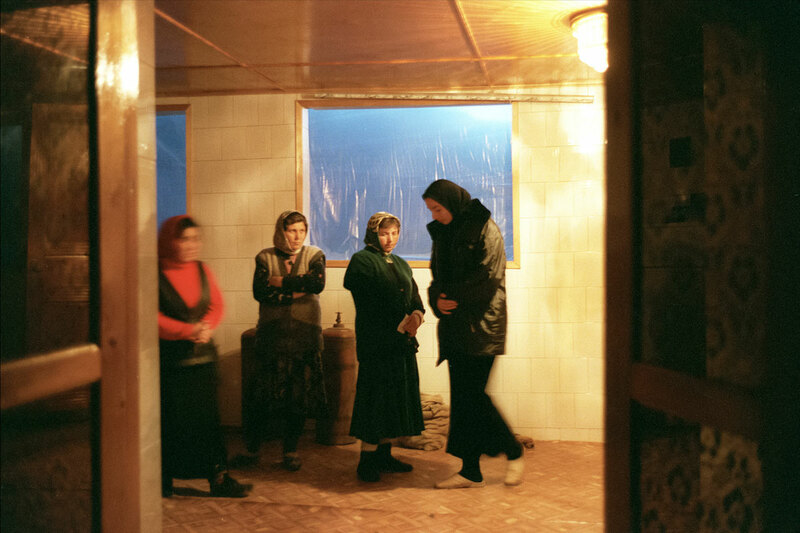 The last passageway between Chechnya and Georgia, leading through the Argun gorges, having been cut by Russian parachute troops 18 December 1999, the only remaining route is nothing but pathways through the mountains that must be crossed on foot. 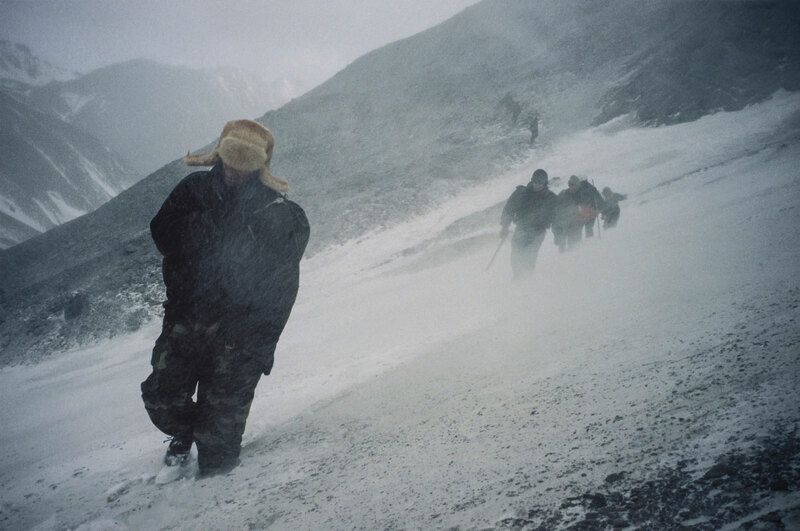 This mountain pass is at an altitude of 3,700 meters (about two and a half miles).